One quick job recently was strip and clean a 1958 Fabrique Nationale .22LR Semi Automatic Take Down rifle. My views on these little rifles is well documented, I am a real fan of them and we have a couple here with the other being a 1956 model. 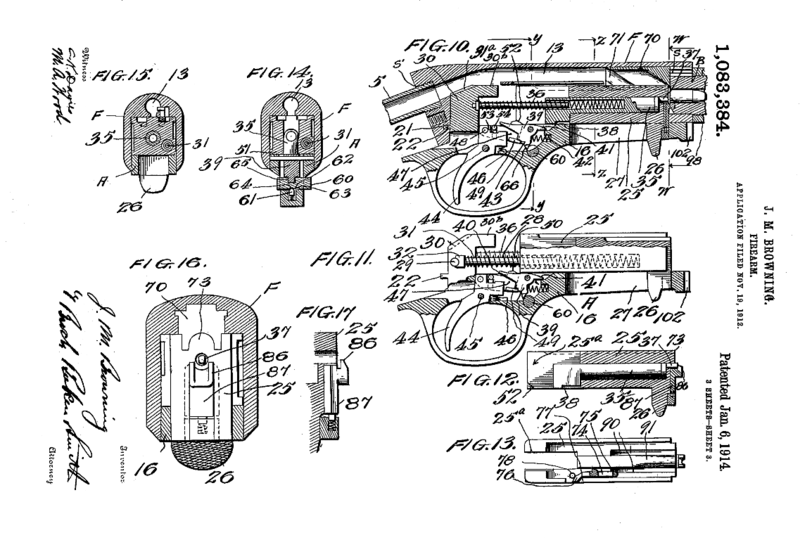 The differences are subtle such as a slightly different safety button and the 1956 model trigger set is numbered, also the charging handle on the point is a different profile and the claws to hold the magazine follower differ slightly. 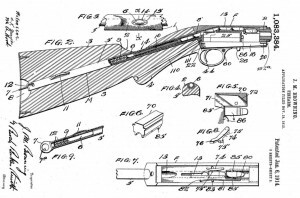 The task was simply to strip, clean and inspect and the process is wonderfully simple, push the small barrel latch on the underside Watford, slide the bolt back using the catch on the underside, twist the barrel 90 degrees and you have a rifle in two pieces. 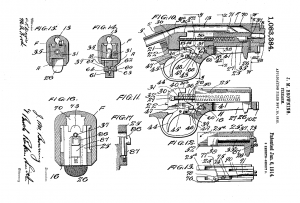 Now hook your thumb into the trigger guard, slide the bolt back towards the guard and push the whole trigger and guard assembly and you now have your rifle in three pieces. It is probably quicker to do than it took you to read this paragraph. Time to remove the bolt from the lower trigger assembly, there are two springs, the one to the right hand side is the recoil spring, I always remove this one first by rocking the bolt up slightly and hooking the clevis end out, take care as it has every chance of becoming a ‘PingDammit (Yes, the polite version) Once that is out you can push the firing pin spring forward and hook it out and finally remove the bolt, a flat bladed screw driver is a perfect tool for these operations. Alternatively you can frantically tug and rattle the bolt and with luck everything will fly apart. 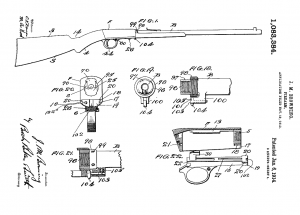 I would not recommend this approach regardless of what you see on the internet, this is a Browning designed rifle and should be treated with the according reverence. 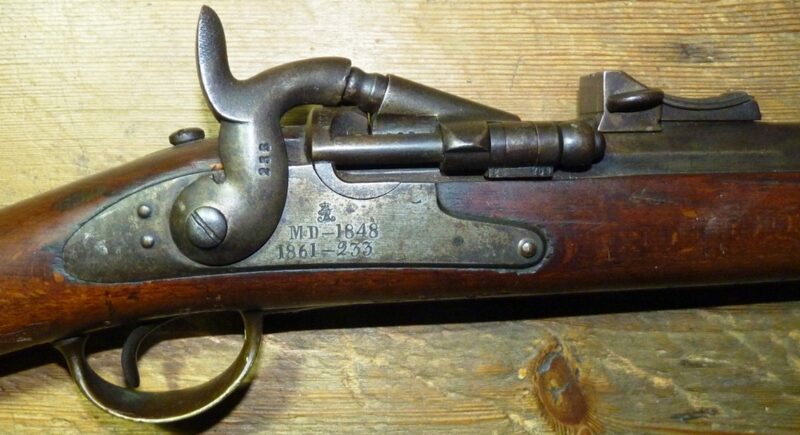 Fascinating isn’t it, we now have a rifle fully stripped for cleaning without recourse to any form of tools and you can actually get this far with your fingers. Next stage is drop the removable cartridge guide out, it is held in place with a spring which can be pushed to the side, probably time to resort to a penknife at this stage, also there is the cartridge stop which has a tendency to fall unnoticed during cleaning anyway however if not invert the receiver and give it a hard smack on the upper surface and it should drop out. How remarkable is that? 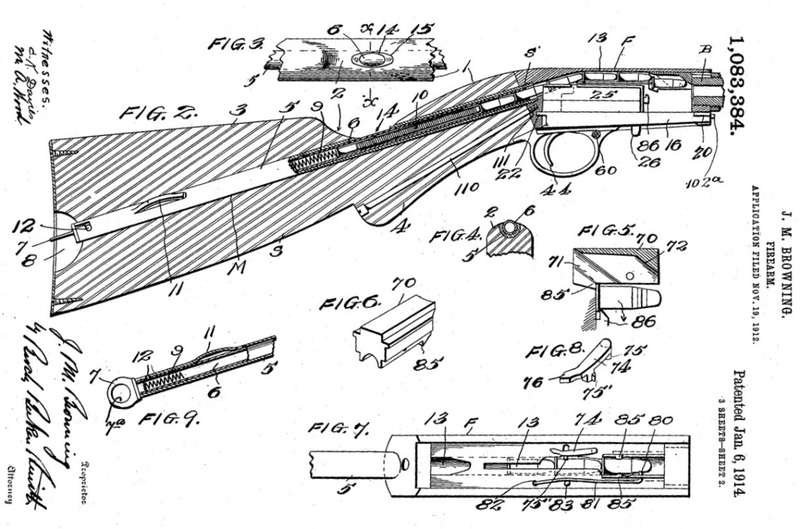 The rifle is stripped for a thorough cleaning with your fingers and a trusty penknife, I have nothing but respect for John Moses Browning. This particular rifle was well gummed up, semi auto rifles are filthy things after a few hundred shots and always benefit from a good clean. I used Paraffin and a soft brush to remove the worst of the fouling followed by an old tooth brush and some rag. It is worth taking your time and do keep an eye on the parts, I should have used an old tobacco tin in keeping with the age of the rifle and the strip for cleaning procedure. Re-assembly is a reversal of the strip down and points of care are the cartridge stop which is probably best relocated with some nosed pliers, other than that you could get away with your trusty small pocket knife. I did take some pictures along the way however I messed something up and ended up with an empty image folder on the camera and yes, I did take the lens cap off! 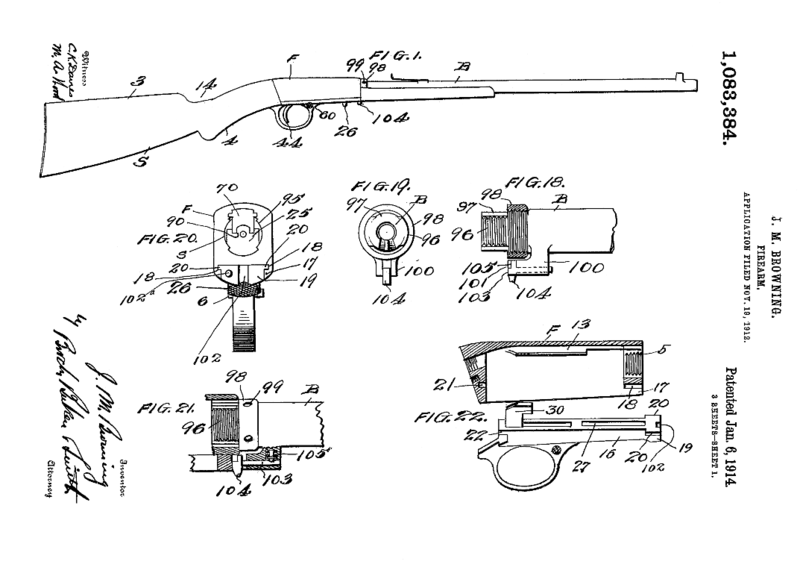 In the absence of working images here are some copies of the original Browning patent first filed on November 19th 1912 to show the rifle workings. In keeping with the rifle’s age an old Leg of Mutton case was found and the rifle fitted neatly inside.